CT LIVE! 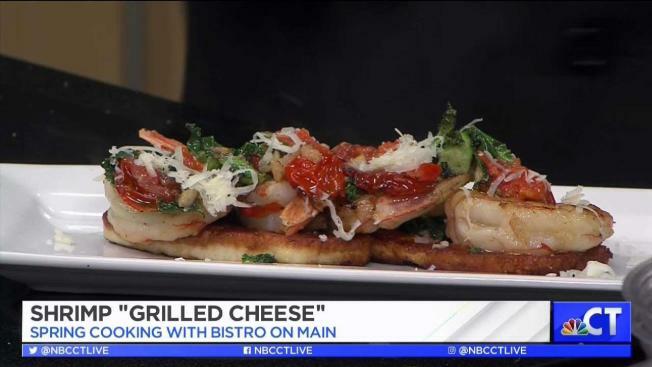 : Shrimp "Grilled Cheese"
In medium hot saute pan, heat olive oil. Season shrimp with salt and pepper and saute 2-3 minutes. Add cheese to pan and grill unto browned, flip and keep cooking until brown on 2nd side. When adding the cheese, add the shallots and garlic, as well as tomatoes. Saute 2-3 min. Finally add the spinach. Season with salt and pepper. Deglaze with white wine, reduce until wine by half. Off of heat, swirl in butter and allow to melt to finish sauce.